Let $X$ be a L\'evy process with regularly varying L\'evy measure $\nu$. We obtain sample-path large deviations of scaled processes $\bar X_n(t) \triangleq X(nt)/n$ and obtain a similar result for random walks. Our results yield detailed asymptotic estimates in scenarios where multiple big jumps in the increment are required to make a rare event happen. In addition, we investigate connections with the classical large-deviations framework. In that setting, we show that a weak large deviations principle (with logarithmic speed) holds, but a full large-deviations principle does not hold. Rhee, C.H, Zwart, A.P, & Blanchet, J. (2016). 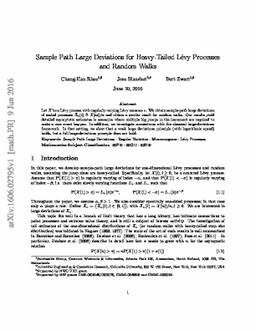 Sample Path Large Deviations for Heavy-Tailed Lévy Processes and Random Walks.